The card game “1000 Bornes” is a perennial toy department bestseller in France, with more than 10 million sets having been sold. 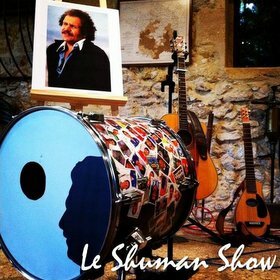 The story began in a basement in Arcachon. Arthur Dujardin, whose pen name was Edmond Dujardin, was born and raised between the wars in Lille. 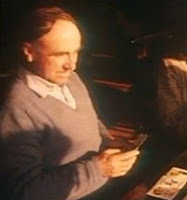 He was a musician and prolific inventor who began trading as a printer then as an author of highway code books and driving school teaching materials. In the 1940s, he began to suffer from acute asthma and travelled to Arcachon to take in the town’s renowned quality sea air. Dujardin elected to stay and, in 1947, moved into number 63, Boulevard de la Plage. In the closing paragraph of the previous post, Invisible Bordeaux was poised to enter Bordeaux via the inland route from Le Bouscat as followed over the years by thousands of Way of Saint James pilgrims on their way to Santiago de Compostela in north-western Spain: the “el Camino de Santiago” pilgrimage known in France as “les Chemins de Saint-Jacques-de-Compostelle”. The 8.4-km route through the city itself, which has been added to the Invisible Bordeaux GoogleMap, leads out of Le Bouscat along Avenue de Tivoli. A small square marks the official arrival in Bordeaux... and that may just be a scallop-shaped sculpted feature there to greet the pilgrims! For more than a thousand years, pilgrims have followed routes from different parts of Europe to the cathedral of Santiago de Compostela in north-western Spain, where it is believed that the remains of the apostle Saint James are buried. 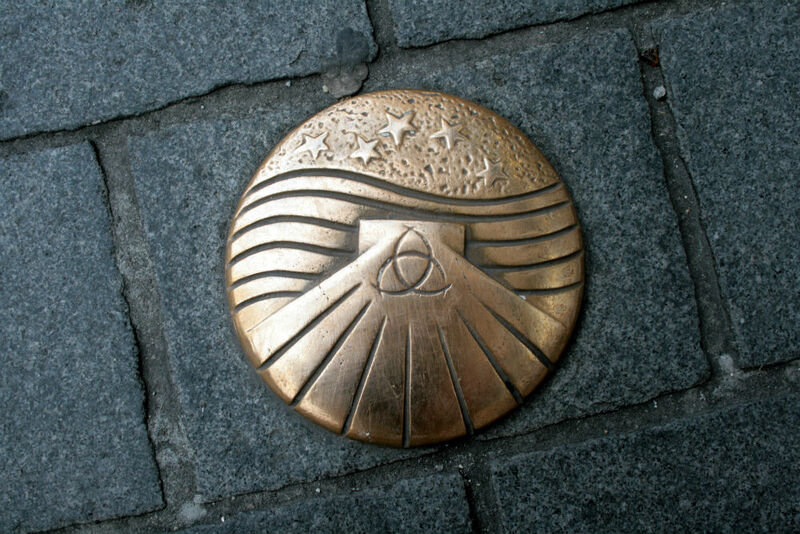 The pilgrimage is what the Spaniards know as “el Camino de Santiago”, the French as “les Chemins de Saint-Jacques-de-Compostelle”, and what English-speakers call “the Way of Saint James”. Bordeaux trams have become such an integral part of the landscape in the city that they even feature on postcards. The 21st-century transport infrastructure could have been very different though because, for many years, the plan was to build a light railway network which would have looked something like the artist’s impression pictured above. Trams in Bordeaux are nothing new. Horse-drawn trams were introduced in 1880, followed 20 years later by the city’s first electrically-powered trams. The network went from strength to strength over the following decades, and by 1938 160,000 people were travelling daily on the 38 different lines, which covered a cumulative distance of 200 kilometres – many lines extended beyond the city itself to suburbs such as Créon, Cestas and Saint-Médard-en-Jalles. The central Bordeaux tram and bus network in 1940 as featured in "l'Histoire des Tramways et omnibus à Bordeaux" and previously published by in Mysticktroy's Blogpaper. Come the late 1940s, the network was in a bad shape and the trams were ageing. 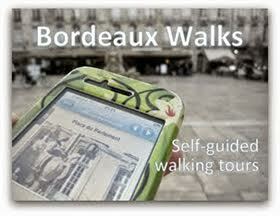 A new era was dawning and buses and private cars were set to reign over the streets of Bordeaux, as elsewhere. Mayor Jacques Chaban-Delmas (elected in 1947) and his municipal council decided to pull the plug on the tram network, and lines gradually folded until just two remained in service. These ceased operating on December 8th 1958, in ceremonial scenes that were caught on camera. Click here if video doesn't display on your device. By the 1970s, the uglier side of the age of the automobile was only too plain to see, and Bordeaux drivers and commuters regularly had to contend with gridlocked roads and boulevards. At the time an underground transport system was considered but the project was soon dropped because drilling through the city’s swampy terrain would have had disastrous consequences below the surface and at ground level. 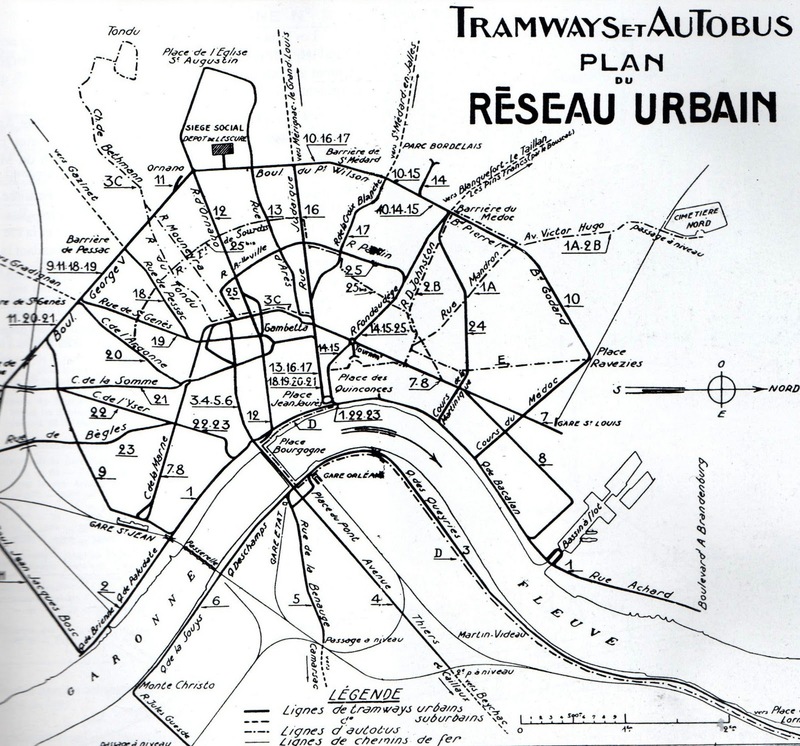 Tentative plans were aired in 1981 for a new-generation tram system, championed by Michel Sainte-Marie, then mayor of Mérignac and chairman of the greater Bordeaux council (Communauté Urbaine de Bordeaux or "CUB", now Bordeaux Métropole). The following year, the city’s urban planning agency presented a full project, featuring a network that was similar in shape to the one in place today. Work was scheduled to begin in 1984… except that in 1983, the man who replaced Sainte-Marie at the helm of the CUB was none other than Jacques Chaban-Delmas, the man who had phased out the first tram network 30 years earlier and who made his position clear: he had no intention of reintroducing into the city this form of transport, which he considered outmoded. Instead, Chaban-Delmas’s vision was that of a VAL (Véhicule Automatique Léger) light railway/metro system, like the one in Lille which was big news at the time, having rolled out in 1983 (in fact, VAL originally stood for Villeneuve-d'Ascq - Lille, after the first line). The underground option had become a legitimate solution given that technical advances meant it was now possible to drill underground without upsetting the groundwater table. The company Matra was commissioned to conceive the system. How the VAL network would have looked. With the exception of the Communist representatives, the project was initially supported by all parties and the Chamber of Trade and Industry. But as the plans began to take shape, cracks began to show. Members of the general public (some of whom joined forces to form the association Trans'Cub) were also increasingly vocal about their reservations, favouring a shift back to trams. The main issues were the high costs involved in delivering a network (initially estimated at 4 billion francs, 600 million euros) that would be made up of just two lines covering a lowly 11 kilometres in all, and solely within central Bordeaux despite funding being provided by all the local councils making up the CUB. (A second phase was planned but lack of finances meant it was impossible to say when it would roll out.) Secondly, unlike tram stops, metro stations were expensive beasts and a frustratingly small number were planned. Finally, in order to cross the Garonne, the VAL would have to travel at depths of at least 25 metres. At the nearest planned station, passengers would be faced with a hike back to ground level that was equivalent to that of ascending an eight-storey building. Costly studies on the VAL continued until 1994. In January of that year, members of the CUB voted for the implementation of the project which was now well on course for delivery in 2001. However, a final vote was held in July 1994 with a view to finalising the proposed concession agreement. This was narrowly rejected, in turn delaying the project launch. An additional sub-plot was the upcoming retirement of the then 80-year-old Jacques Chaban-Delmas from political duties. His successor, come 1995, was Alain Juppé. Juppé later related* that when passing on the baton, Chaban-Delmas said to him “Dear friend, you’ll build my metro” (Cher camarade, vous ferez mon metro). In response, Juppé remained silent. He had other plans, soon backed up by existing studies and formalised in a 1996 report (le Schéma directeur des déplacements urbains communautaires). This publication was the final nail in the coffin of the VAL project, and was the first of a succession of green lights for the large-scale new-generation tram network, the first three lines of which were delivered in 2005. > Further information about VAL light-railway networks, which are operational in Lille, Toulouse, Rennes and at Paris Orly and Roissy airports. > Additional 1988 news report on progress, worth viewing until the end if only to briefly see the newsreader's massive shoulder pads. > Excellent piece about this subject on Mysticktroy's Blogpaper.